Fede Alvarez has provided us with an update on the status of Labyrinth 2. The Jim Henson classic has had a sequel in the works for a few years now and Alvarez, whose previous credits include Don't Breathe and the Evil Dead remake, was tapped last year to helm the project. Now, he's offered us a little insight as to where the project stands and how he plans to approach it. We recently heard that the script for Labyrinth 2 was complete. While it's true that a draft of the screenplay is done, which Fede Alvarez co-wrote with Jay Basu, who he also worked with on his latest movie, The Girl in the Spider's Web, the process is far from over. I recently had the chance to speak with the filmmaker in honor of The Girl in the Spider's Web and got some clarification from him on that front. Here's what he had to say about it. "I never said the script is complete. I never believe the script is actually complete. We do have a first version of it, we have a first version that I think is amazing. I'm sure we've gotta write more because that's the way we do with Jay [Basu]. We're gonna keep writing until we believe that it's a perfect script. We're gonna try to get there because that's one that has such a beloved fanbase, me included in it, that I would never do anything that's far from perfect. Or at least I'm gonna try to aim there. It will take some time because that's not something you rush. It's been enough years that I think no one should rush that one. We're gonna try and get it right." 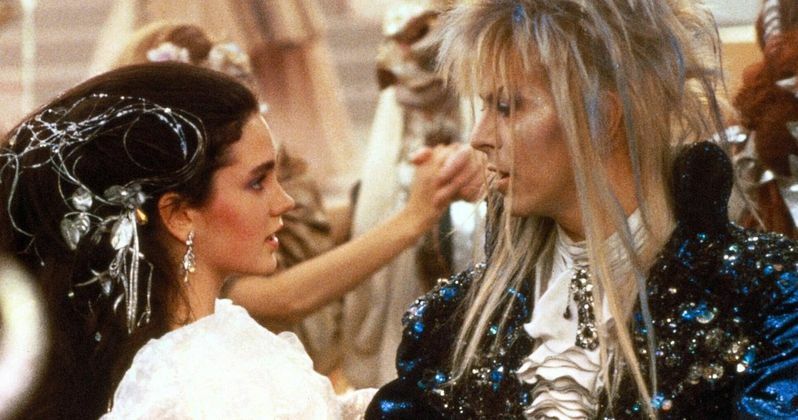 Labyrinth was released in 1986 and starred the late David Bowie as Jareth the Goblin King, alongside Jennifer Connolly in one of her early roles as Sarah, who is tasked with rescuing her baby brother Toby from a mythical and mysterious land. The movie does indeed have a very loyal fanbase and it wouldn't make any sense to rush it. Any value in Labyrinth 2, from a studio perspective, surely lies in delivering a quality product. Rushing it at this point would only do harm. Fede Alvarez has proved that he can give some much-needed juice to a dormant franchise. His Evil Dead remake was a big hit and The Girl in the Spider's Web is yet another example of him taking a previously established franchise and revamping it. But for Alvarez, this is much more personal and offers him a chance to actually make a direct sequel to a movie he personally loves. Here's what Alvarez had to say about why he decided to take on the project in our conversation. "That was basically because I'm a fan of the original and again, in this case, it's something that I haven't done. Where Evil Dead was kind of a remake, but at the same time it was a sequel, because the events that happened before did happen in our Evil Dead. But it was different characters. That was one thing. Whereas [The Girl in the Spider's Web], that was more of a different chapter in the story, where you bring in a new actor to play an iconic role. In the case of Labyrinth, it's the only one, which I haven't done that yet, of a straightforward sequel. But it's a sequel to a classic and a continuation of that story. And with Jay Basu, my co-writer on Spider's Web, we had what I thought was this great idea to continue that story and jump so many years later and pick up that story now. We got really excited about that and we started collaborating with the Henson's, with Jim Henson's daughter." Fede Alvarez also has Don't Breathe 2 and Evil Dead 2 on the back burner, which he may wind up taking a producer's role in, as opposed to directing. Point being, he's a busy guy. For now, Labyrinth 2 remains without a release date, but it sounds like things are trending in the right direction. Sony is behind all of these projects, so it largely depends on how they want to proceed. We'll be sure to keep you posted as more details are made available.